In July 1793, the revolutionary government decided that the Dauphin should be separated from his family. Marie Antoinette fought like a tiger to prevent it, but to no avail. When they threatened her daughter too, she gave in. The distraught Queen would spend hours at a little window hoping to see a glimpse of her son, but even this consolation was soon denied her. In early August the Queen, who had sunk into depression, was taken away too. Elisabeth begged them to let her go with her sister-in-law to the Conciergerie, but her request was refused. Elisabeth was now left alone with her niece and, convinced she would be next, tried to prepare the young girl for life on her own. She taught her how to make her bed, dress herself, keep her room clean, and told her to exercise her legs in their small cell. On 6 October 1793, the two women were interrogated about some incestuous allegations that the Dauphin had made against his mother and aunt. Elisabeth was horrified and so was her niece, although the younger girl was too naive to understand what they were talking about exactly. The interrogation was in preparation for Marie Antoinette’s trial but aunt and niece were never told that. Nor were they told about her execution. As the Terror became more ruthless and the hatred of the aristocracy and royals grew more violent, life for the two prisoners became even worse. They were regularly insulted and searched for small belongings that were then taken away from them. Even their candles were removed, forcing them to go to bed as soon as the sun went down. And their food was meager and unappetizing. Elisabeth talked to her niece about better days, but also gave her practical advice that she would need once alone, such as making sure she was always dressed in the presence of the guards, and, at night, refuse to let them in until she was fully clothed and out of bed. On 9 May 1794, at 9 o’clock in the evening, the guards came to take Elizabeth away. The princess kissed her niece goodbye and tried to comfort her, but was then dragged out of the room by her hair. She was taken to the Conciergerie, the antechamber to the guillotine. Her trial was held shortly after her arrival at the Palais de Justice. Elizabeth was accused and found guilty of assisting the King’s flight and supplying money to the emigres. She was condemned to die the next day. 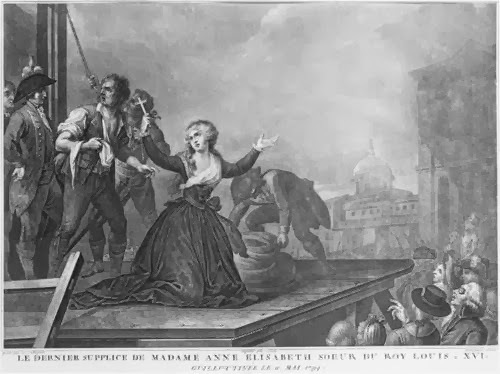 Later, when she was brought back to the prison, Elisabeth found out, from one of the women who were to die with her on the scaffold, that her sister-in-law, Queen Marie Antoinette, had been guillotined seven months before. 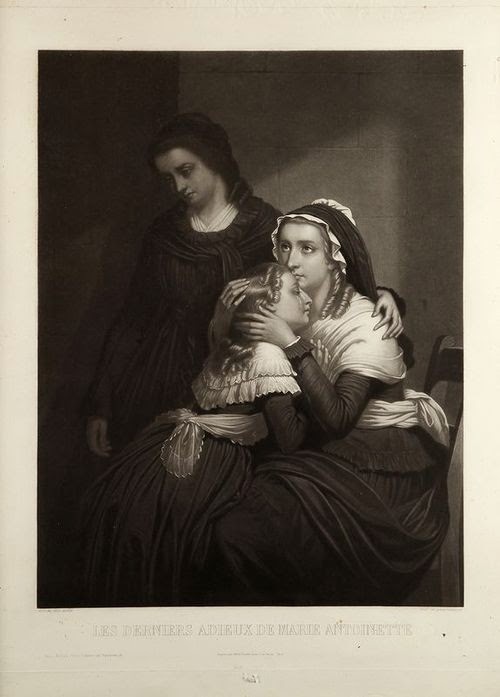 It was a hard blow for Elizabeth, who had believed her to be still alive. The pious princess was also refused her last request: to see a priest. There was nothing for her to do but quietly wait for death with her companions. The next morning, 10 May, the executioner and his assistant roughly cut her hair and tied her hands behind her back. Then, Elizabeth, together with the other prisoners, mounted on the cart that was to take them to their execution. 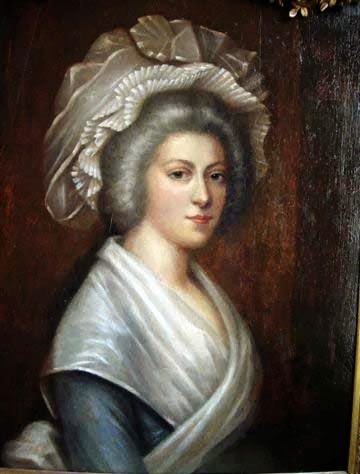 Robespierre had been against killing Elisabeth, fearing it would turn her into a martyr. He was proved right. Although the people hated the aristocracy and the royal family, they remembered Elizabeth’s many charitable and good deeds, her piety and kindness. They were disgusted that such a virtuous woman should be so unjustly executed. The princess remained calm and composed, showing no sign of fear. She tried to comfort the women who were to die before her. They all curtseyed and kissed her before they were executed. Eventually, they were all gone. It was now Elizabeth’s turn. Refusing the executioner’s help, the princess went up the steps to the scaffold. When she was being tied to the wooden plank, her shawl fell off and exposed her neck. Elizabeth cried to the executioner: “In the name of your mother, Monsieur, cover me!” They were her last words. Then, the blade fell down.